Todd’s school loves trilingualism, Americana, and foul cafeteria food. Fortunately for us, it also loves a good three-day weekend. 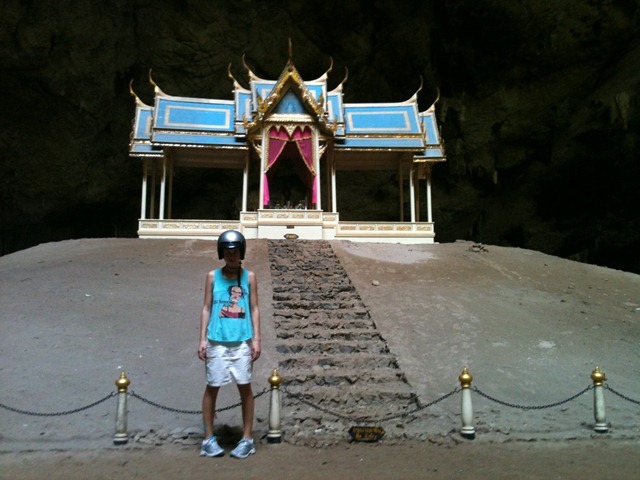 When the school bestowed the latest bounty of vacational abundance, we decided to return to Khao Sam Roi Yot, the site of Todd’s birthday birding adventure. 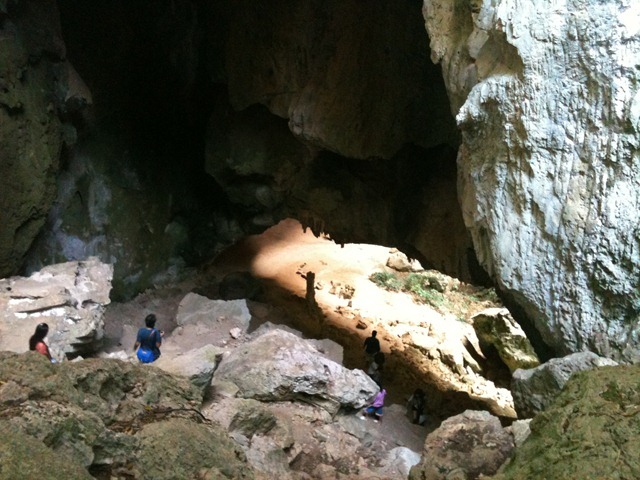 Because that trip was all about our feathered friends, we didn’t get a chance to explore the park’s main attraction: caves. We set out on Saturday morning to remedy this. We were so focused on reaching our dimly-lit destination that we almost missed this gem: a Buddhist temple that has a roof made out of Heineken bottles. A photo of weird old men urged us on. And then straight up a boulder-strewn path. 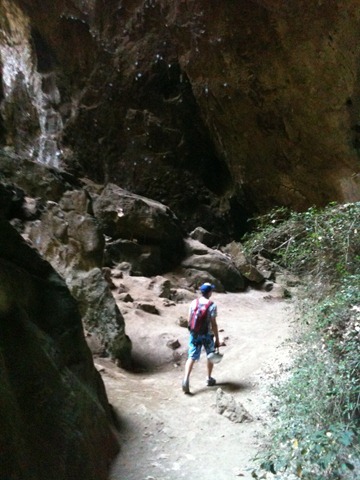 At this point, I had visions of Indiana Jones and The Temple of Doom running through my head. Dang. There go my plans for the afternoon. 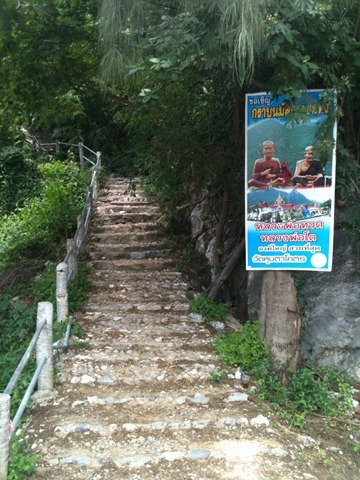 We then began the descent into the cave. I’ve always found exploring natural wonders in Asia to be extra-exciting, because there’s a sense that anything could happen – you could be clobbered by a falling stalactite, or consumed by an unknown reptile that the tourist signs forgot to mention. Risk-mitigation is not the highest priority. 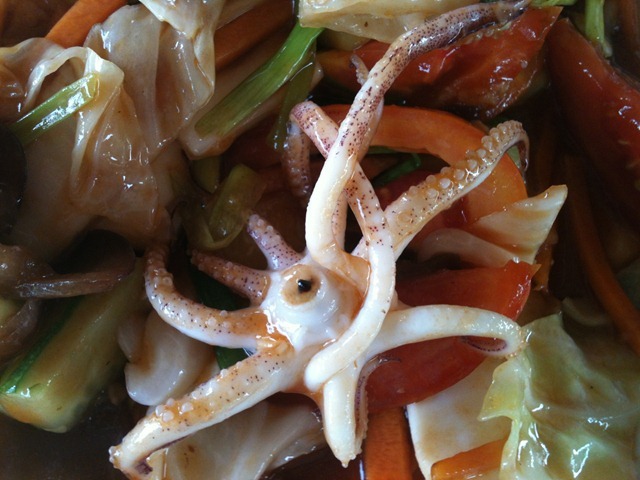 “Mai pen rai” (no problem) seems to be the attitude – one less farang polluting Thai culture. 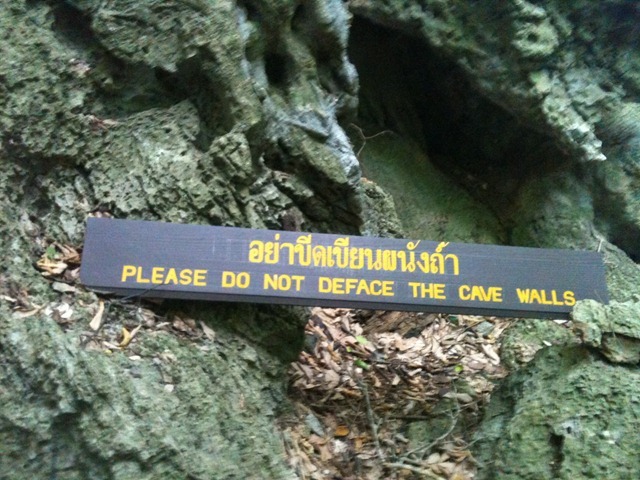 We finally reached the belly of the cave. It was an eerie contrast of dark and light – on one side, sunlight streamed in and plants grew, while the other half was dark and dank. 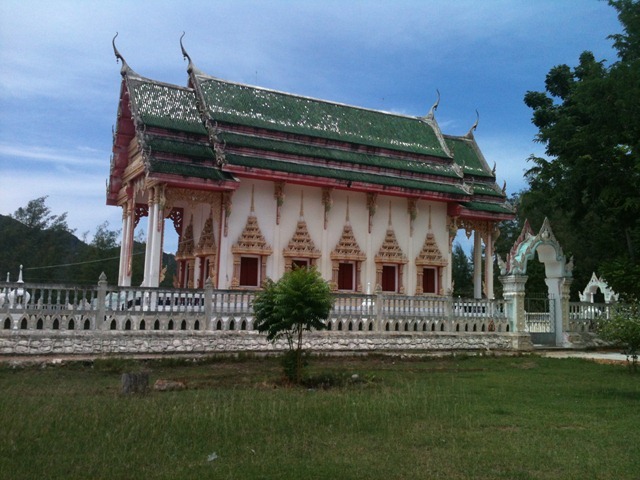 While it was an intriguing place, we couldn’t understand why it was considered so historically significant, until we saw a sign proclaiming that 3 Thai kings had visited it. That’s it. 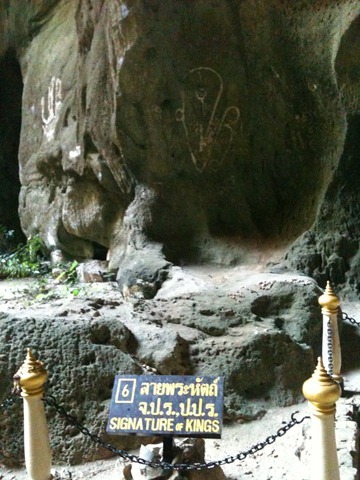 The Thai people love nothing more than a good king, and the fact that three had visited the cave was enough to guarantee it a spot in the annals of history. The main attraction was a wall with the kings’ signatures. 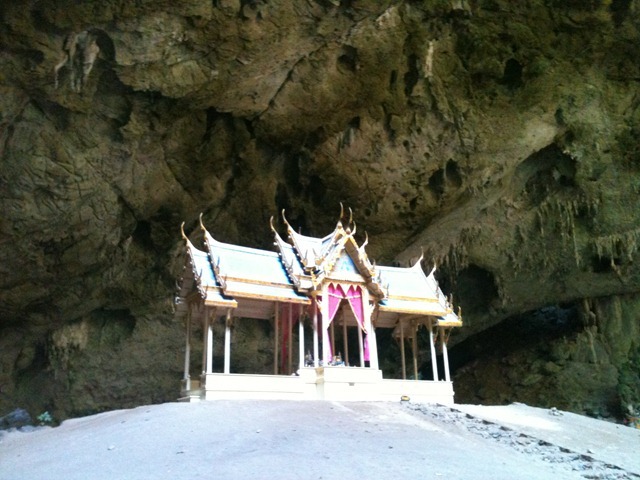 A sala (shelter) was built in the centre of the cave to hold an image of the current king. There was another feature of the cave that interested me even more than the kings’ signatures: the fact that the walls were covered in spider webs. Apparently, spiders dig a good cave as much as kings do, because the walls were fairly blanketed in the stuff. It was all I could do to keep from retching. Todd, on the other hand, went off like a regular cave-dwelling Gollum to collect some critters to feed to his favourite feathered friends. I hung out by the sala in hopes that the king would protect me from errant arachnids. Good thing I had my motorbike helmet to protect me. I finally dragged Gollum out of the cave, and we headed back to the hotel. 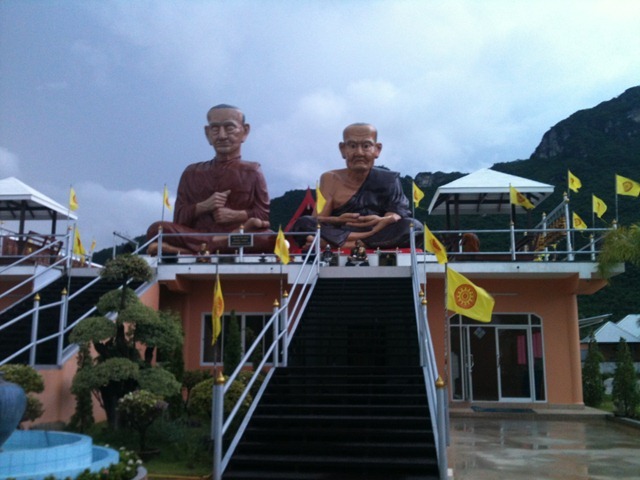 Apparently, we hadn’t experienced quite enough weirdness for one day, because we happened upon this shrine, which we’d seen advertised throughout the area (see the picture from the beginning of our hike).This photo doesn’t quite capture it, but I think the models were made by a sculptor who was just learning his craft. Blaring Thai heavy metal only added to the charm. I can’t wait to see what the next long weekend holds. Well, it’s just been a week full of birthdays around here! First the Queen, then Todd, and then the Queen again, because her birthday celebrations last for a week. I told Todd that we should head over to the palace and combine celebrations, but he insisted on having his own special day. He was certainly well feted, because half the contractors in the apartment building showed up to air hammer our doorframes at the same time that 15 of our teacher-buddies showed up to celebrate. There was probably one person for every year of his life present (I won’t mention the precise number of years, but let’s just say that it rhymes with “dirty-tree”). Now, birthdays around here mean one thing, and one thing only: birding time! Nothing brings joy to Todd’s heart like the twitters’n’chirps of his fine feathered friends. The birding began with a special cupcake from Michelle and Lisa. I showed my support for Todd’s birding habit by eating the beak off his bird cupcake. 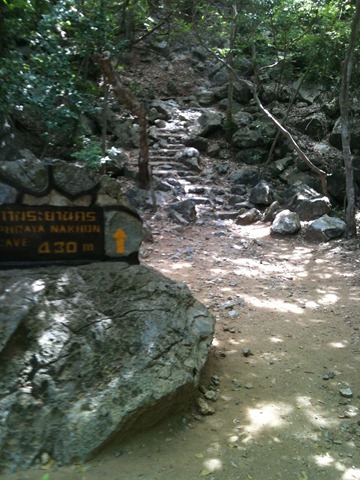 I also planned a surprise Birding/Birthday trip to a national park three hours south of Bangkok. 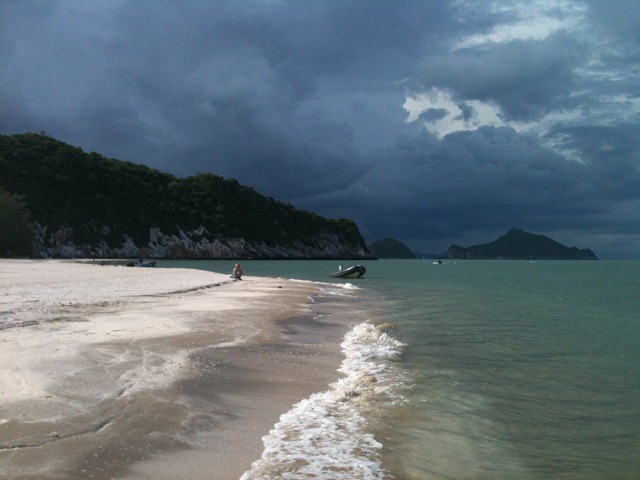 This necessitated staying at an adorable beach resort* in Prachuap Kiri Khan province. The things we do for our little cluckers…. We spent Saturday swimming in the creepily warm water (“there are no sharks in Thailand, right Todd?”), where I got stung by a jellyfish. This was a new and not entirely enchanting experience. Coming from Calgary, I’m used to dealing with threats that are either minuscule (mosquitoes) or monstrous (grizzlies)**, with pretty much nothing in between. Getting stung by something that you can’t see felt unfair. They should at least have given me a sporting chance. The only thing to do was to drown my sorrows in a vat of ghee, presented in the form of Indian food. I may be Canadian, and I may be living in Thailand, but my gut is loyal to one country, and one country only. Don’t worry, Mother India. No amount of pad thai will ever come between us. The feather action began the next morning. Because this trip was planned by me, not Todd, we only had the roughest idea of where we were going. The helpful owner of our hotel drew a map for us: “drive up a random dirt road, turn left at the shrine, pass the ruined shrimp farm, hurtle down the steep hill, and stop at the ranger’s station. Someone should be able to take you out into the marshes on a boat.” Say no more. We rented scooters, and headed off early the next morning. Hand-drawn map? Check. Birding shirt? Check. Todd still had a good time checking out storks’n’who-knows-what-else, while I sat and contemplated life, got into an altercation with a pack of dogs, and tried to converse with a local rooster, who didn’t seem to be feeling it. That afternoon, we decided to take out our hotel’s tandem sea kayak (I don’t mind doing the conjoined thing if it means that Todd does all the paddling) and explored one of the islands in the bay. I initially regretted not bringing my camera, but in retrospect, perhaps it’s for the best. The island was covered in monkeys, and the acts in which they were engaging scarred my eyeballs and would not be appropriate for a PG blog. Here’s another picture of the bay instead. All in all, Todd had a great birthday weekend, even if it was a little light on the birds and heavy on the jellyfish and copulating monkeys. Once again, as we drove home, the Queen beamed benevolently at us from numerous highway shrines, because it is still her birthday. *No, this is not a paid endorsement – just wanted to put in a good word for a friendly place.